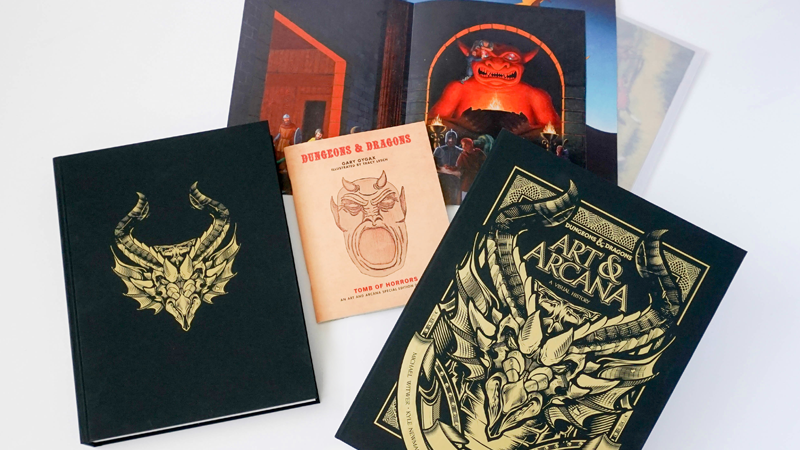 The special edition of Art & Arcana, in all its loot-encrusted glory. Ready your bags of holding, because you’re going to want to stock up on this awesome special edition of the upcoming Dungeons & Dragons: Art & Arcana—and we’ve got an exclusive look at the goodies contained within. Publishing this October from Penguin Random House, Dungeons & Dragons: Art & Arcana offers an insider look at the evolution of the legendary tabletop RPG franchise, from earliest days of the classic red box to the behemoth it has become today. Written by Michael Witwer, Kyle Newman, Jon Peterson, and Sam Witwer, Art & Arcana’s journey is told through the art that has emblazoned player manuals and adventure guides throughout D&D’s esteemed history, offering looks at classic covers and even early concept art and design work from the art teams behind the game. Example interior pages from Dungeons & Dragons: Art & Arcana. But while a normal, lovely edition of the book is on the way, a lavish special edition—complete with, I kid you not, extra additions officially labeled as “Ephemera,” which feels D&D as hell—gives you even more tabletop goodness, and io9 can exclusively reveal a first look at the contents. Held inside a clamshell emblazoned with art from artist Hydro74, the “Special Edition Boxed Book & Ephemera Set” version of Art & Arcana features a special hardback cover featuring part of Hydro74's art, as well as a collection of small prints of iconic pieces of D&D artwork ready for framing. But perhaps its coolest bonus is a special pamphlet reprint of one of D&D’s most infamous adventures, the legendary player-killer dungeon Tomb of Horrors crafted by D&D co-creator Gary Gygax and first released in 1978. Featuring artwork by Tracy Lesch, the Art & Arcana edition of Tomb of Horrors is based on the original unpublished version of the module Gygax crafted for use at the first Origins Game Fair in 1975. The hellish adventure was designed to test, and infuriate, the mightiest of D&D parties. So you know, a bit of tabletop torture to accompany your sumptuous art book. Both editions of Art & Arcana will be out on October 23rd, with the standard edition costing $50, while the special edition will set you back a hefty $125. Hope you’ve got some gold in your coffers! You can find out where to purchase the special edition here, and if you want to get an up-close look at the special edition, copies are being displayed during this weekend’s Stream of Many Eyes D&D livestream event—plus, you’ll be able to meet the authors and get an even better look if you’re attending in person.